Welcome to the year 2205. In a backstory that will hit the real world soon enough, people have used up the vast majority of fossil fuels that the Earth has to offer. Renewable sources will only get you so far. You have been tasked to create a new corporation and enter the Lunar Licensing Project, jet off to the moon and solve the energy crisis by building on the moon and utilizing the resources there. Getting to the moon isn’t as simple as just firing a rocket there and settling where you land. You need to build up your manpower and resources across multiple regions of Earth to start with. 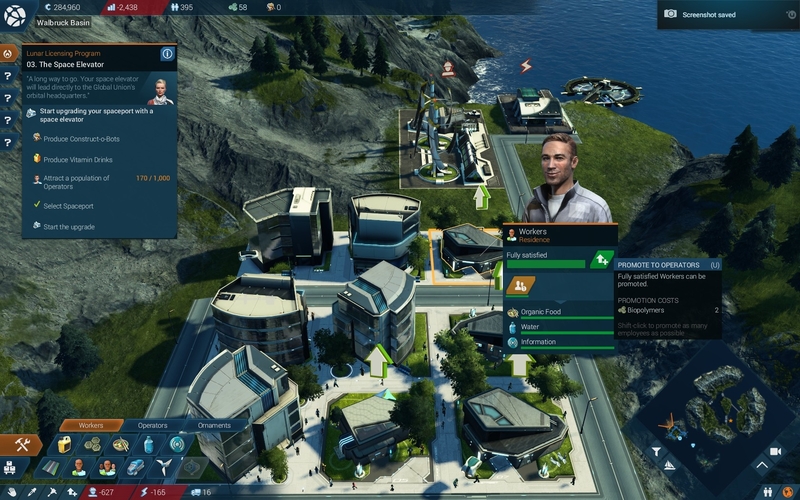 This brings us to Anno 2205’s major feature, the interconnected world. Similar to SimCity (2013) there are a number of areas for you to build in, with each area having the ability to trade resources with the other, linking your corporate empire together. Unlike SimCity, each area has a huge amount of land for you to build on and create a true self-sustaining city and the only reason you are forced to create a new settlement is that you need to go to a different region that has access to a different set of resources. At times it feels like the game offers three separate city building games in one big package. You start in the temperate region of earth. This is your standard city building with nothing beyond the norm to worry about. When you progress the game sends you to the arctic region of Earth. Building here is a challenge and any housing you place has to be within a certain radius of a heat-generating source. Finally, you get to go to the moon where you need to build shield generators that will help your lunar colony withstand the any asteroids that would land on it. 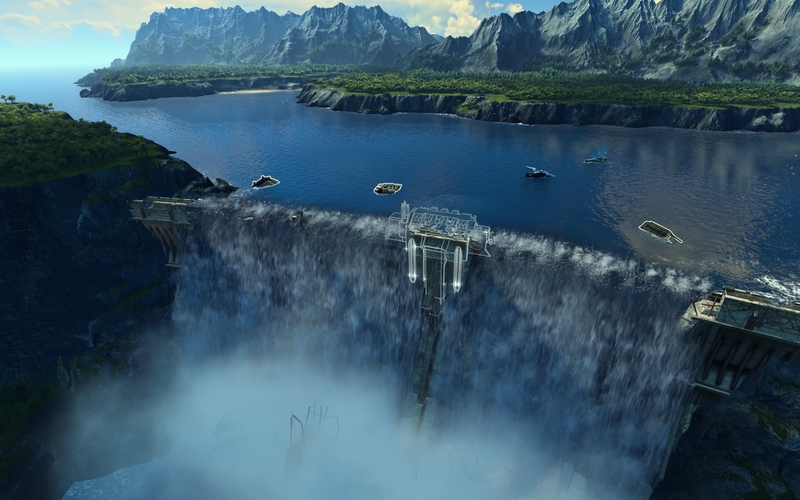 Whether a good thing or not (it’s purely a matter of opinion), Anno 2205 is streamlined compared to earlier entries. Considerably so when compared to older entries like 1404. Like before, you build houses for your workers and the way to upgrade these is to provide access to a certain need or luxury item. This in turn gives you access to later stages of goods and buildings, which you then use to manufacture later luxuries and also trade with your other colonies. The trade system is the clearest example of a streamlined approach taken here in 2205. In previous entries a map would have different islands on a map and, as a result, different colonies which would have to trade with each other on a more local level. Here the area, even if you own and run three separate colonies on different islands, share resources in a pool. The trade then is left to a quick click and select process on the global map, where you can select a resource from one region to simply automatically create a trade route of a specific value that continues until you stop it. Relegation of trade to a simple background action also has a knock-on effect on the core city building in just how easy it makes it. You no longer need to worry about positioning of a factory, the distance something is from your workers or the major supply area. Everything is instantly added or deducted from the pool of resources so there’s little requirement for any strategic planning. So long as a building has a connection to a road that leads to your hub, you’re fine. Should you need to move a building, you don’t even need to destroy it and rebuild, just drag and drop. The only thought you need to put into it after that is which modules you will add to your factories, as you are limited to a certain number that will reduce the required manpower, the cost of running or the energy requirements. This will be anathema to most Anno purists and I can understand why, even though I like the changes that have been made in streamlining the building and trade. What I am not a fan of is the neutering of the real time strategy elements. Where before the map where your built your city could be host to battles as you fought off enemy troops, that’s been done away with in favor of battles taking place in completely separate maps reached through the world map. It makes it feel like the strategy was an afterthought, more so when you notice that practically all of the battles can be skipped, even those in the major quest chain. Despite this, I can see Anno 2205 garnering a number of fans, even those loyal to the older titles. The streamlined approach can be quick to pick up and play, easy to learn and very rewarding. You don’t need to wait hours to see a positive result from your actions which is always a good thing. This does mean that you’ll complete the campaign very quickly and at there isn’t a great deal to extend the game’s life beyond the first one or two playthroughs. 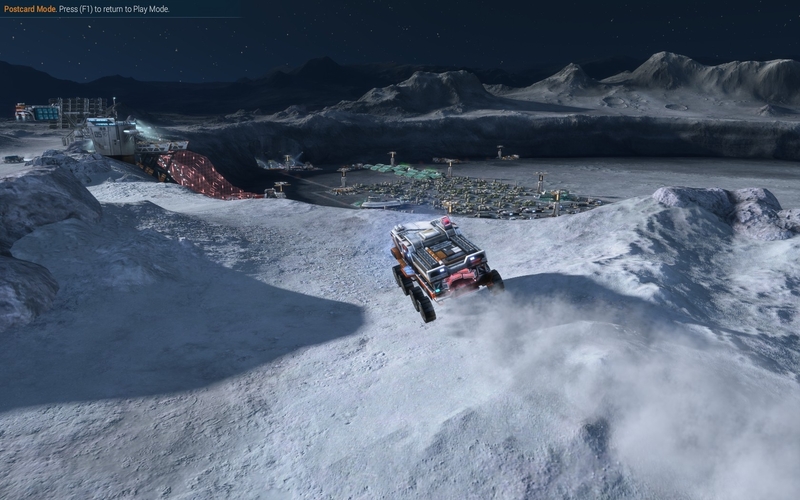 Anno 2205 is one of the few times a streamlined approach and an aim for simplicity has paid off. At times I think it may have gone a little too far, where now there isn’t even any concern about where to place your buildings so long as you have them. That’s possibly just the obsessive compulsive in me just wanting everything to be neat. The relegation of combat to an afterthought also hurts the game, but not enough to detract from how fulfilling it can be to see your colony grow, made only that much better due to how beautiful the game is; Anno 2205 is probably one of the best looking titles in the genre. 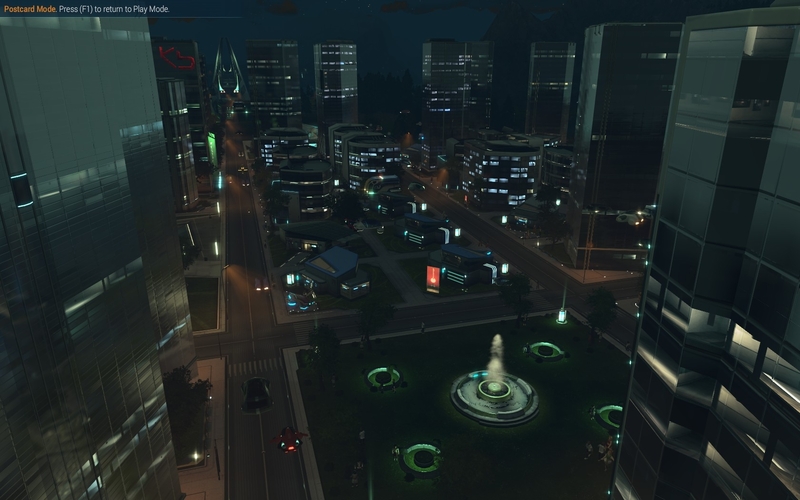 Anno 2205 is a fun and fulfilling game, it's excellent to watch your colonies grow, but after your first one or two playthroughs it's going to become a little too much of doing the same thing. It's in dire need for extra maps and areas with a little more competition thrown in from either the AI or multiplayer competition. It's extremely fulfilling to watch your colonies grow and expand, made all that much easier with how simple the game is to pick up and play and also made that much better by how appealing the game is. Without any shadow of a doubt, Anno 2205 is beautiful to watch and fun to play. The streamlining featured in 2205 is taken a little too far at parts, leaving little to no strategy in the actual building and positioning of your colonies. In addition to this, what was once a staple of Anno, the RTS elements, have been relegated to an afterthought.